Highway 95 bridge shadow across the Colorado River at Narrow Canyon portion of Glen Canyon. It must be spring: notice the green riparian vegetation. We begin (actually just me) at Hite Crossing of the Colorado River in Glen Canyon. The muddy river, naturally, upstream from Lake Powell. Brown cliffs on both sides, blue sky above. Whoops, don’t forget the thin strip of green riparian (streamside) vegetation that has leafed out. It’s spring. The Colorado River, looking downstream from the Highway 95 bridge at Hite Crossing. Enough of this shameless gawking at the river and the cliffs and the snow capped mountains in the distance. Let’s roll on down the road. But not far, before the golden glowing plumes of Prince’s Plume caused me to veer to the side of the road. Prince’s Plume wildflower, Glen Canyon, Utah. Next was the Yellow Cryptanth. Really small yellow flowers with fuzzy cups and stems, they don’t like to hog the limelight. Whipple’s Fishhook Cactus and Common Paintbrush, Glen Canyon. I love it when I can get two different wildflowers in the same photo. Especially when they’re different colors, too. The green of their leaves can count as a third color. If you’re counting such things. Whipple’s Fishhook Cactus blossoms, Glen Canyon. If you’re only attracted to the big, showy blossoms of the season, shame on you. The true naturalist is drawn in by the more subtle ones, too. Like Blackbrush, with its diminutive yellow flowers. Blackbrush blossoms in spring, Glen Canyon. Let’s veer on over to the white side of the flower spectrum in Glen Canyon: Cliffrose. Its blossoms are fairly showy. Not bright white, a rather yellowish white. But the fragrance will make you remember. In case you’ve forgotten, this is all in the desert. Speaking of which, we come to one of the most desert like plants, the yucca. With its evergreen bayonet leaves and a needle like tip that will make you remember not to carelessly stumble into it next time, they also have one of the most amazing flowering habit. Namely a stalk that grows as quickly as corn in Ohio (don’t ask for scientific proof, I don’t have it) to sent creamy white blossoms as delicate as their “leaves” are formidable. Narrowleaf Yucca and flowering stalk, from above. Maybe it was time for a break from all the lushness. I stopped near the Highway 95 bridge over the Dirty Devil River and walked out onto the span. Which you can do easily here, since there is almost no traffic. The Dirty Devil River, from Highway 95. Notice the lighter “bathtub ring” above the newly reborn green along the river that had been drowned by Lake Powell when it was full. South of Hite I once again paused along the highway. I do that a lot. And why not? In this case it was a relatively short span across an unmarked canyon. You would drive across it in couple seconds — whump, whump — without noticing. White Canyon bridge, Highway 95. You would have just crossed White Canyon, just upstream from its mouth into the Colorado River. No big deal. Right? But pull over. Walk to the edge, or onto the span and look down. Yeah, totally different realization. Lower White Canyon, from Highway 95. I made a few exposures onto the camera memory card that I’d hoped portrayed the overall scene. 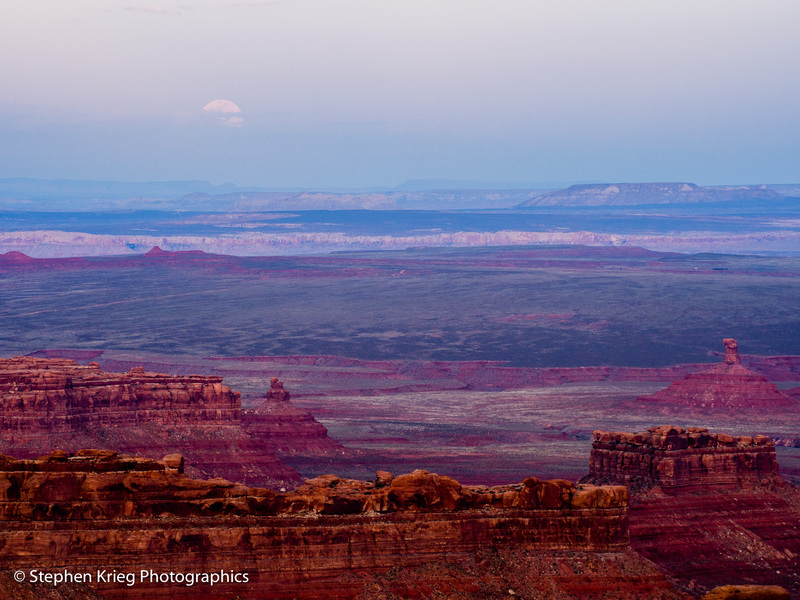 The desert varnish streaked cliffs, the red buttes in the distance. Then I let my camera lens follow my gaze to the floor of the canyon. It was an overcast day, devoid of the strong sunlight and black shadows so typical of canyon country. The cliffs above were the beige of Cedar Mesa Sandstone, ancient “petrified” (not the right term, but nevertheless) sand dunes lifted up from sea level eons ago. And at the bottom the (temporarily) dry streambed that somehow had carved its way down. Still does, in fact. Since erosion never sleeps. The streambed of lower White Canyon. Narrowleaf Yucca flower pods along their stalk. Photo Location: Glen Canyon National Recreation Area, southeast Utah. Kachina Natural Bridge, April greenery. Previously I have called the relatively bland scenery in canyon country after the deciduous leaves have fallen and before there is snow blanketing the cliffs as being “in between the colors”. Singleleaf Ash springtime leaves and flowers, White Canyon. Oh, sure, since there are always the pinyon pines and the junipers, along with some evergreen shrubs, cacti and yucca there is always plenty of green around the high desert. But you don’t realize how much the brighter green of the cottonwood and box elder trees, the Singleaf Ash, and the shrubs and forbs add to the color mix in spring and summer. Which only makes one appreciate springtime that much more. Silvery Lupine, White Canyon near Fry Canyon. So last week I was able to hike down into White Canyon to visit Kachina Natural Bridge once again. I thought about how favorite trails get easier the more you hike them. Never boring; there’s always more to notice that you missed previously, or that has changed since last year. Newberry’s Twinpod on the “beach” at Kachina Natural Bridge. Down at the intermittent stream that drains White Canyon, Kachina Bridge was complemented by the bright springtime growth of the Fremont Cottonwood and Box-Elder trees about halfway leafed out. Box-Elder tree spring growth: flowers hanging like strings. Underneath the massive natural bridge — youngest of the three in the Monument — there is a large sandbar that we call the “beach”. It makes for a pleasant place to hang out, especially in afternoon sunshine. Though this day was overcast, allowing photos of the bridge and canyons without the usual high contrast of bright sunlit areas and deep shadows. Ancient inscriptions (petroglyphs) on Kachina Natural Bridge buttress. On the beach were Newberry’s Twinpod, Mountain Pepperplant, and some others. Spring wildflowers on the “beach” beneath Kachina Bridge. As usual I paused to examine the numerous ancient inscriptions — both petroglyphs (pecked into the stone) and pictographs (painted on the stone, including handprints) — on the buttresses of the bridge. North Buttress of Kachina Bridge and pool of water in White Canyon. Also another walk up to the sandy bench along the north buttress of the bridge. There is a very special area there, containing some small adobe structures (probably granaries or storage of special tools or ceremonial stuff), handprints, and many inscriptions pecked into the cliff face and adjoining boulders. Ruin at Kachina Natural Bridge. Note the handprints on the cliff wall and the ghostly pictographs painted inside the low adobe structure. Photo Location: Natural Bridges National Monument, southeast Utah. Campsite with a view, edge of Cedar Mesa. April 21, the day before Full Moon, and I was — as usual — plotting where to photograph the rising moon over the desert landscape. It had to be somewhere reasonably close to home, say 30 miles, or I wouldn’t be able to get there in time after work. Shadows creep up the side canyon wall. So I chose the southeast rim of Cedar Mesa. Although I greatly prefer situating myself so that the moon rises over some prominent landscape feature such as mountain peaks, this was not going to be one of those times. So instead I chose a yawning expanse of southeast Utah canyon country, overlooking the Valley Of The Gods and the lower San Juan River valley, with Colorado’s Sleeping Ute Mountain in the far distance. I had heard from a local about a couple of dirt roads leading to the rim in that area — facing east — that I had not explored. Now was the time. On my second try I drove out a road that soon came to the rim, the edge of the 1,000 foot drop the southern escarpment of Cedar Mesa provides above the Valley Of The Gods. No one was there: perfect. Cape Solitude. Cedar Mesa Sandstone boulders just below the rim of the mesa. To my left was a south facing cliff wall, the north side of a short side canyon. I was interested in the house sized chunks of Cedar Mesa Sandstone that had fallen onto the next shelf of rock just below the mesa top. Being south facing, I wondered if there were any Ancestral Puebloan ruins among them, or rock panels with inscriptions such as petroglyphs and maybe pictographs as well. 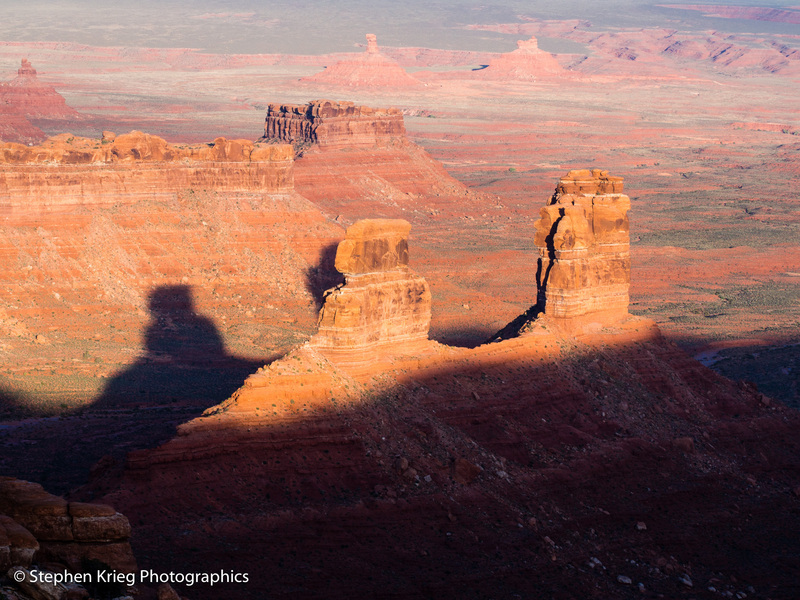 Red Buttes below in Valley Of The Gods. 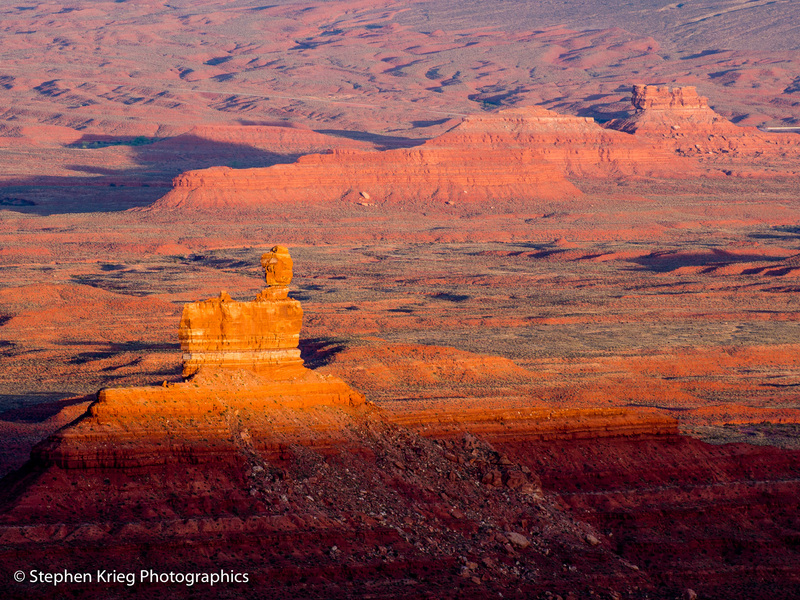 The lowering sun warmed the red buttes of the Gods far below. As I sat in my chair, camera on tripod in front of me, watching the golden hour show, waiting for the moon to show (which is also the name of a favorite Bruce Cockburn song). Ancestral Puebloan cliff dwelling ruin. How did I ever miss it? Then I glanced at the opposing cliff face again, now that the sunlight was off it. 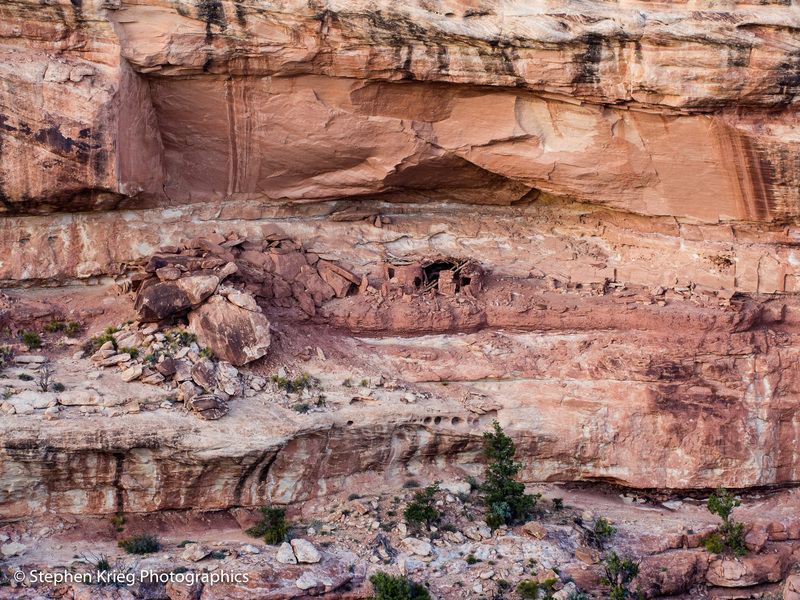 There it was, an ancient cliff dwelling ruin in an alcove about halfway down the cliff. Plain as day. 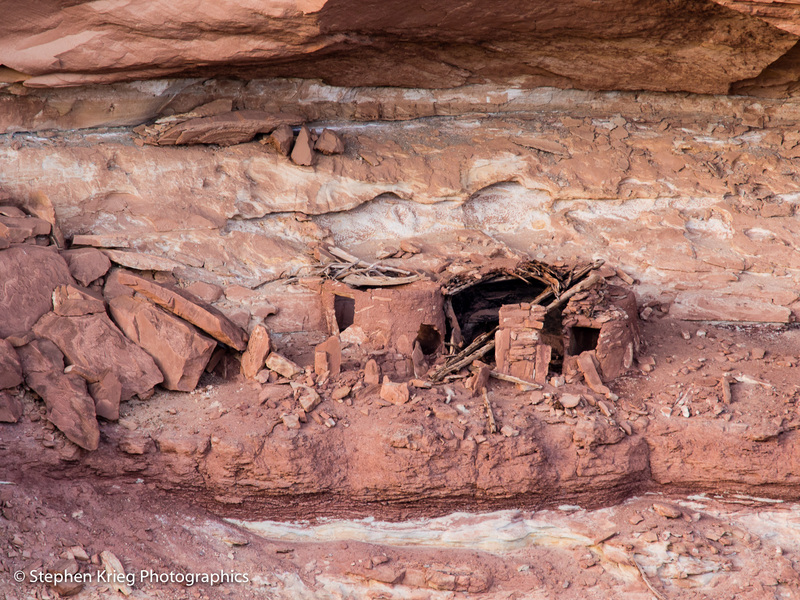 Closeup of the cliff dwelling ruin. On with the sunset show. The redlands below were glowing warmer and warmer. Valley Of The Gods sunset show. The eastern skyline was fairly hazy, so that when the moon did creep into view just before sunset it had a slightly pink cast. 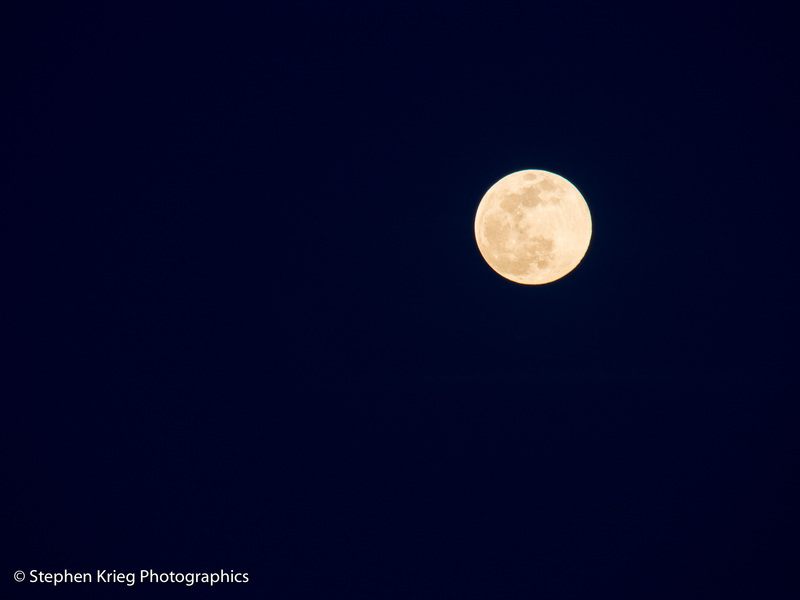 The moon begins to show above the eastern skyline haze. Sleeping Ute Mountain had fallen into a deep shade of blue. The redlands were now burnt red in twilight, no longer glowing. Pink moon coming up from the haze. With the sun down, the rising moon turned from pink to yellow, a product of the haze. And finally to white after it was above the haze. 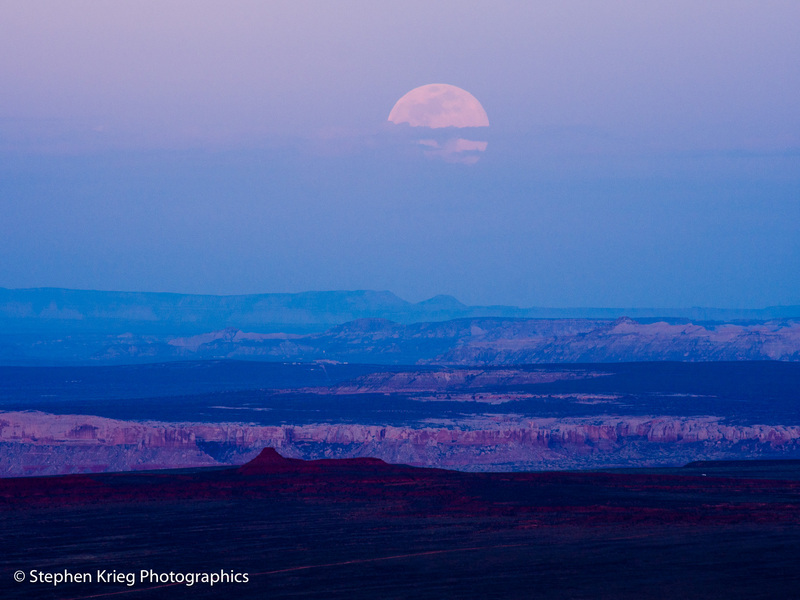 Moonrise over Valley of the Gods and San Juan River Valley. Sleeping Ute Mountain at horizon left. I made a variety of wide shots, closeups, and overlapping images for panoramas. Nearly Full Moon rising, April 21, 2016. Finally it was dusk. Time to retire to the vehicle for the night. Moonrise and Sleeping Ute Mountain, from Cedar Mesa. My “Cape Solitude” was also Cape Serenity. 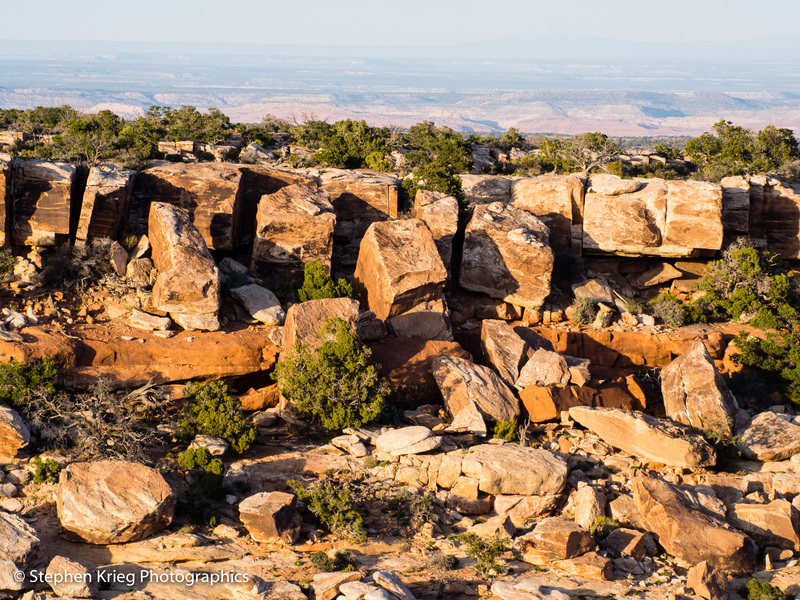 An exceptional spring evening on Cedar Mesa. Moonrise at dusk, Cedar Mesa. 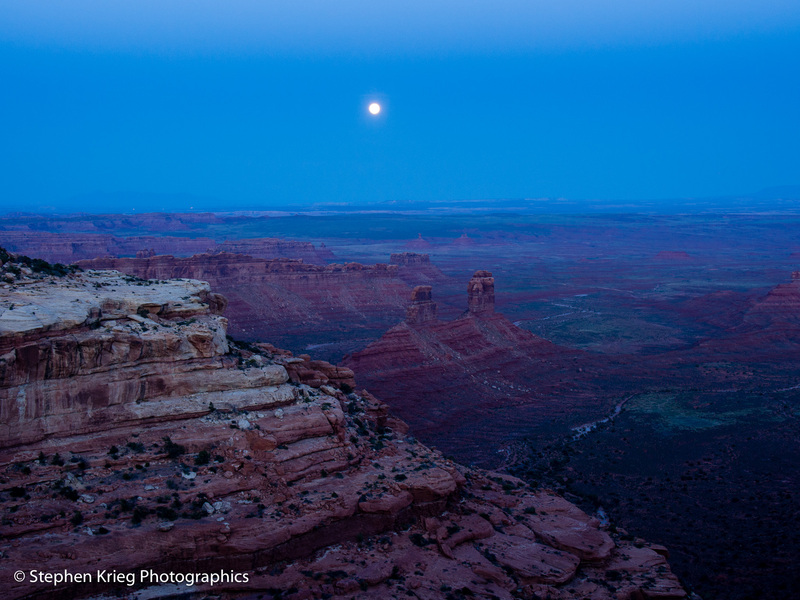 Photo location: Cedar Mesa, San Juan County, southeast Utah. The Henry Mountains, from Hanksville, Utah. I stopped in Hanksville, Utah to refuel. Both the gasoline tank and the stomach, the latter at Stan’s Burger Shak. The Henry Mountains were still shining with a nice snowpack. The day was growing late. Onward. East (actually northeast) on Utah Highway 24 to Interstate 70. Rain clouds over the San Rafael Reef. UT-24 in this long, 45 mile stretch mostly parallels the San Rafael Reef, a geologic picket line of jagged upthrust rock. The light was wonderful, but I didn’t have time to swing westward to shoot there. Painted desert cliff formation just east of the San Rafael River, Hwy. 24 near I-70. Sunset time was approaching as I sped eastward on Interstate 70, where the speed limit in Utah is 80 MPH, 75 on the Colorado side of the state line. The La Sal Mountains from I-70. To the southeast the La Sal Mountains were being teased by rain or snow clouds. The Book Cliffs and Mancos Shale hills along I-70. To the north of the Interstate the Book Cliffs predominate the view. Book cliffs in cloud shadow shortly before sunset. As the evening shadows grew longer, I made use of some of the exits that access nothing more than lonely ranch roads. “No Services” means no town, not even a convenience store. But they are handy for pulling off the Interstate to photograph the view. Services along this stretch are limited to Green River and Thompson Springs. La Sal Mountains in sunset colors. Finally, sunset lit up the La Sals and some isolated clouds, and the rest of the drive would be in the dusk and the dark. 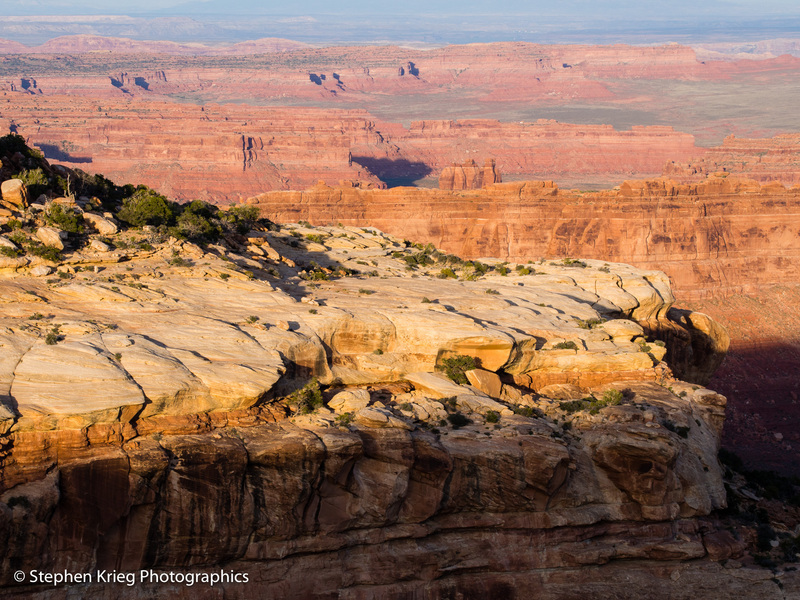 Photo locations: Emery and Grand Counties, eastern Utah. Hite entrance sign, just off Utah Hwy. 95, Glen Canyon. In Edward Abbey’s classic Desert Solitaire, about his experiences as a seasonal park ranger in then-Arches National Monument (now National Park) in the 1960s, he replied to visitors incensed at having to drive back out the same way they came in, saying “It looks better going the other way”. Maybe it does and maybe it doesn’t. But the more time you spend somewhere the more you will notice, that’s for sure. And soon after my most recent post “Hanksville to Hite”, I got another opportunity to drive the other way. From Hite to Hanksville. As always I enjoyed it. Convenience store at Hite ranger station, on an overcast spring morning. Hite is where the Ranger Station is in Glen Canyon National Recreation Area. The very upper end of what had been Lake Powell. Now the lake is low enough that the Colorado River at Hite is free flowing again. Maybe always will be. There is no open Visitor Center at Hite anymore. You might catch the National Park Service law enforcement ranger there, but probably not. He will usually be out patrolling his region of the park. There is a convenience store there, open in the summer, and gas pumps open year around. If the pump isn’t hung up with no one there to reset it. I have seen that happen. Hwy. 95 west of HIte, along the Colorado River. Hite is named for Cass Hite, a legendary explorer, prospector, and mining claims promoter who lived in, loved the area, and died there. The townsite named after him is beneath the waters of Lake Powell, even today. So is his grave, I believe, at Ticaboo. Speaking of Edward Abbey, if you’ve read his novel The Monkey Wrench Gang, it’s all situated in this area. Smack dab right here, including the climax of the book. When I first read it, so long ago, I had no idea of where this locale was. Not like I do now. Cross-bedded “petrified” sand dunes of Cedar Mesa Sandstone along the Dirty Devil River, west of Hite, Utah. I recently had to re-read the book after a visitor came in and asked: “Which site in your campground (in Natural Bridges) did Hayduke stay at?” I had to admit that I didn’t know. The answer: it doesn’t give a site number in the novel. Besides, it wasn’t just George Hayduke, it was all four members of the gang. So Edward Abbey’s hilarious, violent, shocking, thought provoking, extremist story of eco-saboteurs (I am not a proponent of such) was on my mind even more on this drive. Utah Hwy. 95 from Hite Overlook. The Gang was protesting the seemingly unbridled commercial development of the desert wilderness in general, and Glen Canyon in particular. They tried to stop the completion of Highway 95 from Blanding to the Colorado River. They tried to take out two of the three bridges crossing the canyon (at White Canyon, and on the other side of the Colorado River at the Dirty Devil River). But the law was closing in fast and they tried to make their escape up into the Maze district of Canyonlands National Park, one of the most rugged areas of desert canyon country on earth. Colorado River below Narrow Canyon, from Hite Overlook. Highway 95 was completed (in reality) to Glen Canyon. A lot of vacationers, especially boaters, enjoyed the new marina facilities at Hite. For some decades. But then the projections of how much water the Colorado River really can provide turned out to be a pipe dream. The lake lowered and lowered. The Hite Marina was removed, and the area became almost as lonely as when Cass Hite lived there in the horse and buggy days. You might say things have come rather full circle. At least significantly so. Highway 95 is still one of the most lonely areas in the state of Utah. Severe and stark, almost bare landscapes devoid of all but a few low growing shrubs once in a while. Wide open skies. Red rock canyons and deep blue skies. The snow capped peaks of the Henry Mountains to the northwest. Utah canyon country. Abbey country. “Painted desert” type sedimentary layers, Hwy. 24, just south of I-70. A recent drive from Interstate 70 to Hite, Utah featured such an amazing variety of scenery that I decided to share it in this blog post. Leaving Interstate 70 about 10 miles west of Green River, exiting south onto Highway 24 brought me past these “painted desert” type of sedimentary rock layers eroding away in all their glory. Lumpy brown Entrada Sandstone rock layers along Hwy. 24 north of Hanksville. It’s about 50 miles from I-70 to Hanksville, the tiny town that has the only services for a long ways in any direction. Along the way you pass Goblin Valley State Park, but without visiting the park you can see some of the lumpy layered brown rock formations that the park was created for. Not long after that you get your first view of the Henry Mountains, which form the backdrop to Hanksville. The Henry Mountains from Hwy. 24 north of Hanksville, Utah. After pausing in Hanksville for a burger at Stan’s Burger Shak, it was then south on Hwy. 95, the road down North Wash to the Hite Crossing at the Colorado River. There can be a lot of cows on or near to the highway to watch out for, because they don’t pay cars any mind. International visitors to the area are frequently puzzled–to put it lightly–over our vast areas without fences to keep livestock off the highways. Open Range. “Cows on Highway” marquee, Hwy. 95 south of Hanksville. At least they warn you. This starkly beautiful landscape contained one of the main hideouts of the outlaw Butch Cassidy and his Wild Bunch. Crossing some more lovely, wide open high desert, the highway starts meeting red sandstone on either side. This is the upper end of North Wash, one of the few approaches to the Colorado River gorge in Glen Canyon that was gentle enough to construct a highway. Lone cottonwood tree and red sandstone, upper North Wash. The red canyon walls quickly rise higher and higher. The late afternoon sunlight and shadows were intriguing. Afternoon sunlight and shadow, North Wash.
Desert varnish streaks down the cliff, North Wash.
Sheer sandstone cliff faces are excellent canvases for desert varnish, which forms where the water runs down the cliff. A mixture of minerals, algae and lichens (something like that, even today the exact process is poorly understood), the darker it is the older it is. So the black stripes there are probably on the order of a couple hundred years old. Something like that. Desert varnish, the black stripes even appear to have lichen growing on the surface. Regardless of what is going on there, exactly, it’s beautiful. Erosion is the Earth falling apart. Beautifully, when it’s natural. Finally it was time to stop once again at the Hite Overlook, at close to sunset time. The Colorado River and the Highway 95 bridge at Narrow Canyon. The surface of the muddy Colorado reflecting the blue sky. Colorado River and Highway 95 bridge, from Hite Overlook. Utah Highway 95 bridge over Narrow Canyon of the Colorado River in Glen Canyon National Recreation Area. Mount Tukunikivats and the southern cluster of the La Sal Mountains. Sun and shadow made for a nice vertical composition of petroglyphs and rock angles.